Istanbul is amazing. A city so rich in history and culture that has been beautifully preserved while at the same time adapting to modernity and Western influence in such a tasteful way. Physically, it is an incredible site with centuries of man's creation against a backdrop of hills and the sea. Despite being littered with tourists (especially in areas like Sultanahmet district), it still feels so authentically real. No matter where you go, what you do, you are absorbed by the Turkish way. Turks are so proud of their culture, and seem to have found a balance of maintaining that pride while Western influence continues to pervade. A balance that I haven't seen in many other cities. I pride myself in making elaborate breakfasts for myself daily, but Turks are on another level. 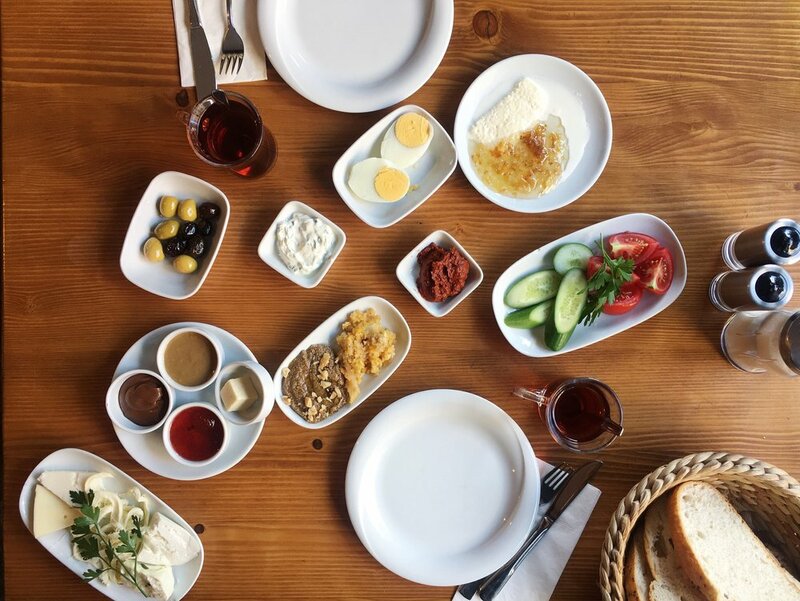 A table full of delicious spreads, local honey, and cheeses and refills of turkish tea. It is so so good. No idea how we stumbled on this spot, but while walking down Istiklal, a detour into a building and up some stairs led us to listening to old Turkish records with the owners of Yaba, a thrift store for books and a small collection of records. Luckily their son spoke a bit of English, and found my interest in records entertaining. My most favorite baklava in the world (sorry Lebanon! ), this stuff is insanely addictive. Luckily, there is a cafe in NYC that has it flown in on a weekly basis. But eating fresh baklava from Güllüoglu was part of our daily schedule in Istanbul. It is THAT good. It's super touristy, but just do it. Opportunities to buy this kind of beautiful craftsmanship don't come often, and you're supporting local artisans. Not quite authentic Turkish food, but a really solid take on a modern interpretation of traditional Turkish cuisine. The space is beautifully designed and has a great ambiance, if that's your thing. Opt for the tasting menu for maximum dish exposure. You'd be a moron to go all the way to Istanbul and only experience the European side. The Asian side feels drastically different, and way more authentic. The ferry is quick, and you'll enter street markets to stroll as soon as you disembark. Have a Turkish coffee at Fazil Bey, serving the best since 1923. Gulaal, the colored powder used for Holi, "is one element that wraps the diverse nation of India into one united race. No caste or racial differences; only one color reigns."